Tirunelveli Halwa is a very famous sweet in Tirunelveli. It is also known as Iruttu Kadai halwa, it is made from wheat especially for this recipe we use Samba gothumai / Samba wheat so it is also called as wheat halwa. This Tirunelveli halwa has a soft and smooth jelly like texture which will not stick to your hands and it will melt in your mouth.When I was studying college in chennai my train passes via tirunelveli district and there was a halwa shop at the station, they make fresh and hot halwas every time and i buy from those vendors and distribute to my friends. My husband is from tirunelveli, whenever I make this halwa he used to tell the consistency is not correct so i kept on experimenting and finally i got the perfect recipe now my husband loves my halwa more than the store bought halwa. Step 1) Soak Samba gothumai / Samba wheat in water for 8 hours or overnight and extract the milk. If you are using full wheat then grind the soaked wheat in a blender and strain it through a cloth or fine filter. Again add some water to the leftover husk and repeat the same until no more milk comes from the wheat. Step 2) After extracting the milk keep it undisturbed for 2-3 hours for the milk to settle. I have transferred it to a long vessel so that it will be easy for us to pour the clear water. Step 3) Now after 3 hours of sedimentation we will get two layers top clear water layer and milk at the bottom, drain the cleared water and add 4 cups of fresh water to the milk. The reason why we are discarding the clear water and adding the fresh water is the fermented and the raw smell of the wheat will be in the top clear water so add fresh water to get rid of that smell. 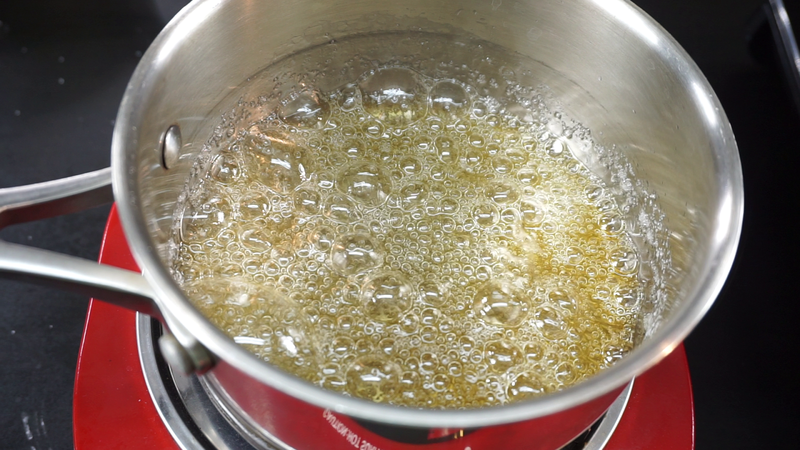 Step 4) In one pan dissolve 1/2 cup of sugar in 2 tbsp of water and caramelize the sugar to get that nice amber color. In another pan dissolve 2.5 cups of sugar in 1 cup of water and bring it to a boil. Gradually add the caramelized sugar to the dissolved sugar and mix well.Once the sugar reaches 1/2 string consistency slowly and gradually add the wheat milk and keep on stirring (do not add too much at once). 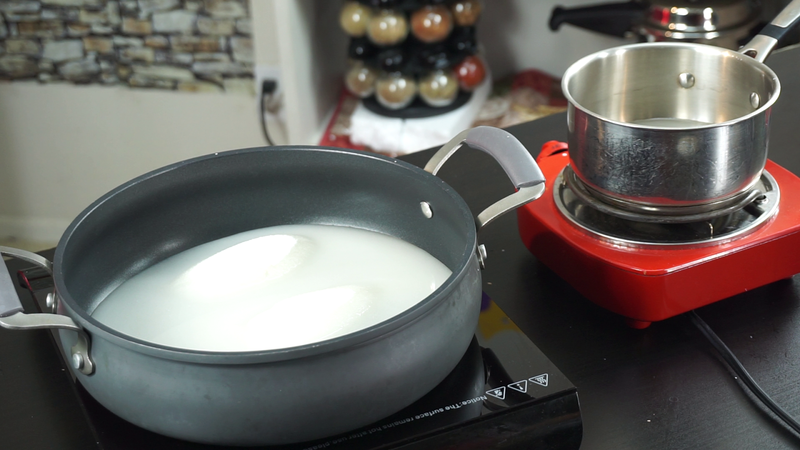 Step 5) After adding all the milk mix it nicely and once it starts to thicken start adding the ghee 1 tbsp at a time and keep on stirring.Initially it will be very watery but soon it will start to thicken. Step 6) Once it start to thicken and ghee starts to ooze out add some roasted nuts and turn of the heat. Traditional tirunelvi halwa does not contain any nuts but to enrich the flavor and taste I have added some roasted cashew nuts. Our delicious tirunelvi halwa is ready to be served. If possible remove the excess ghee oozed out from the halwa otherwise the ghee will harden once the halwa is cooled.If not then you can microwave the halwa for 20 seconds to get rid of the ghee. 6:20 pm - Added nuts and turned off the heat. while making tirunelveli halwa is we need to caramelize the sugar in a separate pan,if we caramelize the sugar first and then if you add water immediately, then the sugar will harden and will take lot of time to melt. So please follow the tips and and i can guarantee you that you will get the best results.Happy Cooking. Hi How are you, all your recipes are very good,I seen your youtube video ,face book website . but when u going to make your recipes in to google offline app. Thanks. Thank you so much, I dont have much recipes now, Once i reach 250 recipes I will make an app for my videos. I tried your Tirunelveli halwa for this diwali and it came out very well. And i'm making it for the second time today.Realy it is a superhit among our family friends.